Emma and I meet up in the Square for a Tuesday lunchtime walk. Hamish is going to be one this week, and they have been busy getting ready for his party. 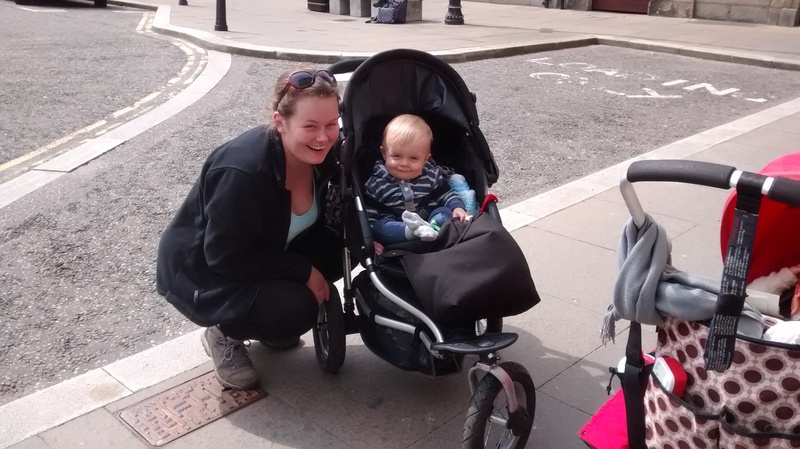 We wait for a little while to see if anyone else will join us, and then decide to head off to test the route that I walked with Susan last week (I think it might become one of the pram walks for the Perambulator map of Huntly). As we walk we talk about first birthdays and family and friends and how amazing the first year of a baby’s life is. We talk about Huntly and how green it is at the moment. We talk about Emma’s house in Cairnie, just outside of Huntly, that she has lived in for around 2 years. She had been living in Aberdeen but moved out so as to buy a house, and also because she wanted to have children, and for them to grow up in the countryside. We talk about walking in Aberdeen, and cycling, and about walking and cycling here. When they first moved Emma didn’t drive, we talk about having to have a car (although she says that you can cycle quite an ok route from Cairnie to Huntly). It’s hot when the sun shines on us, and cool when we’re in the shade. We both take off and put back on our fleeces several times as we walk along. Ruby sleeps as we walk. We talk about work, and children. Emma worked for a year off shore to save money for the deposit on their house – one month on, one month off, 12 hour shifts every day that sometimes stretched to 20 hours. She tells me about the cleaners who worked off shore – especially one Romanian woman who had a 2 year old, she was only paid 20 Euros a day, and didn’t know for certain how long she would be gone for each time – 6 weeks, 8 weeks, we agree this must be very tough for families. We talk about part time work and childcare and flexible hours. We talk about not earning money, and how it feels when you’ve been supporting yourself all of your adult life – suddenly dependent. We talk about the river and the meadows and about flooding, the nursing home here is on the flood plain, apparently it floods regularly. We talk about gardens and how much space there is here. We return to the Square and part ways, pausing to look at the House and shop in the corner next to the Huntly Hotel that’s for sale.